Camiguin Island Roadtrip - discovering the best of Camiguin for four days. Camiguin Island is known as the island born of fire in the Philippines; as this island came up as a result of volcanic eruptions of its seven volcanoes. The island is known for its magnificent volcanoes that mountaineers are eager to conquer and with various tourist spots such as waterfalls, cold springs and hot springs. Add to it its diverse flora and fauna whether on land or under the sea. The island is in the middle of Bohol Sea thus dive sites are everywhere, add to it the friendly and honest people around. The following is Schadow1 Expeditions' coverage of Camiguin as we stayed there for 4 days and 3 nights; mapped the island and then later on, enjoyed it! Camiguin can be reached via three ways. One is via Bohol at Jagna Port; via direct flight to Mambajao Airport from Mactan Airport Cebu and via Balingoan Port at Misamis Oriental in Mindanao. The latter is the more famous route which we actually took. Coming from Manila, we flew to Cagayan De Oro City at Mindanao and from CDO's Lumbia Airport, we took a car (fare is P250) to drop us at Agora Market Terminal to catch a bus to Balingoan. Fare is P140 for airconditioned while P60 is for regular. The ride is about 3 hours. Once you reach the Balingoan terminal, you may wish to walk your way (about 200 meters) to Balingoan port or rent a motorella for P7 each to the port. 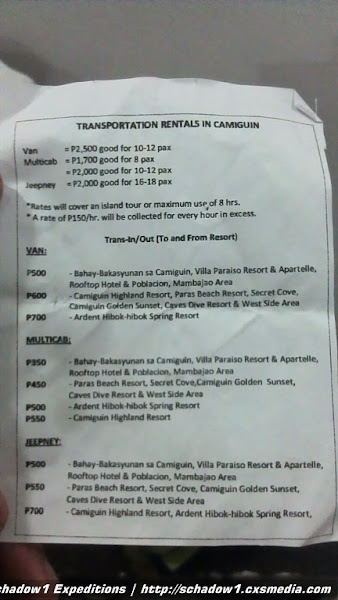 From Balingoan port, you may get a roro ticket for P170 each to Camiguin. These boats leave every 30 minutes and the travel time is about an hour before you reach Benoni port of Mahinog, Camiguin. Balingoan Port. Camiguin Island at the back. As soon as you reach Benoni port, people will be offering their motorcycle or van rentals to you. You can rent a motorcycle (habal-habal) with or without driver to tour you around the island or if you are a in a group, they may offer you a multicab (a small van). Motorella (a motorcycle fitted with a jeepney-type passenger cabin) is the main transport in the island for short distances. We have personally opted to rent a motorcycle as I am only with my wife and I do the driving. It costs P500/day. Sauro and Jonel are very helpful for my transportation needs and you may call them anytime if you would not like to drive and they will send you a driver or a bigger transportation. They even helped me out in getting a place to stay and a guide to climbing Hibok-Hibok Volcano. 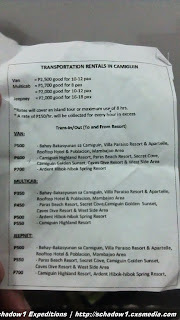 For more information on the prices of tours, you may check the flyer below as it was given by Sauro. Sauro did the negotiation on finding us a hotel and we did get a steal for P800 per day with a big room/house with 2 queen sized beds. We stayed at Paguia Cottages at Yumbing town and we are satisfied with the accommodation and the accessibility of restaurants and tourist spots (specifically White Island). The contact person for the hotel is Ruby (a guy) at +63 915 3664963. For more info on Paguia Cottages, you may check our article here. After we have our transportation, accommodation and itinerary set up we then headed up on our 1st day adventure. Heading on with our roadtrip using a Honda XRM 125cc, we then rode to Camiguin's west side and started off with the Sunken Cemetery. It was once a cemetery of the 19th century that was pushed below sea level by rushing lava from Mt. Vulcan's eruption and is now called Pasil Reef which is a great dive site. For more info, you may check our our article Sunken Cemetery, a cemetery turned Coral Reef. After which, we then got to the Gui-ob Church Ruins that suffered the same fate with the Sunken Cemetery. The bell tower and pillars of the church remains after it was overrun by lava from Mt. Vulcan. Do check out our article Gui-ob Church Ruins, a reminder of Mt. Vulcan's eruptive past. After a series of photo shoots, we then headed on to the culprit of all these destruction during the 19th century, we then trekked the Panaad Walkway (or station of the Cross) at the foot of Mt. Vulcan. It was an hour of trek starting at 58MASL all the way up to 216MASL where you get to view the Sunken Cemetery from above. For a detailed coverage, check out our article Mt. Vulcan Trail 580 MASL. After getting back down, we then head back to our hotel and they arranged for us a tour to the only white sand bar at Camiguin, the White Island which is about 1.5 kilometers away from the shore of Agoho town. The boat ride costs P400 and we were out there in no time doing our jump shots and enjoying the waves. Know more about our White Island experience White Island, A majestic solitary sand bar at Camiguin. After a long day, we then headed back to our hotel and find where to have our dinner. We had gone to a street-food adventure and ate Chorizo (Chinese Sausage), Barbecue, and roasted pork liver along the highway at Yumbing, right in front of Luna Restaurant. Each stick only costs Php 8.00! We woke up early at 5:00 AM as we will be mapping the Yumbing-Ardent Trail of Hibok-Hibok Volcano Traverse. Of which it took us 15 hours to finish. It was a successful mission for Schadow1 Expeditions with the help of our guide, Bibot who can be reached at +63 906 1192537. After a gruelling climb, we satisfied ourselves with pizza from Terraza, an Italian restaurant along the main road of Yumbing Town. We then regained back our strength from a long sleep and re-started our Camiguin Road trip. But now, starting from its east side. Starting off at Katibawasan Falls. You may check out the complete article here: Katibawasan Falls, grandeur with the waterfall flowing from Mt. Campana. We then tried to check out the Giant Clams of Cantaan however the road to it is of bad condition and I felt that the motorcycle could not take it due to the road. We then headed on to Binangawan Falls at Sagay town which is about 9 kilometers from the Main road and is located at 500MASL. This waterfall is known to always have a rainbow unfortunately the road is still under construction and is too steep that the motorcycle surrendered and could not go further. We were 3.5 kilometers short. And so we called it off. Bigger 4x4 vehicles can surely take the toll. We then continued our road trip and headed to Sto. Niño Cold Springs to soothe ourselves from the very hot weather. It was a relaxing swim together with the fishes! Check out our full article Sto Nino Cold Springs, Camiguin. Having circled the whole Camiguin Island, we caught up the sunset while riding at Bonbon Town in Camiguin. After a long road trip, we then headed back to the opposite side of Camiguin, back to Mambajao and dipped ourselves to the soothing Ardent Hot springs by the foot of Mt. Hibok-Hibok. Ardent Hot Springs - relaxing dip after an H2 Traverse. It is pack up time. However, it would not be complete if we had not had a taste of Camiguin's specialty, the Pastel! It is a bread bun stuffed with creamy and sweet pastillas. It costs P75 per box of 6 and can be bought at Vjandep Bakery at Mambajao, their main office. These are also available at Benoni Pier and even at Cagayan de Oro airport. Camiguin is surprisingly full of honest people with only less than 60,000 in population, the people of Camiguin are all smiles. Infrastructure, road projects are everywhere. Even the government of this province seems to work their best to ensure that their island destination would be one of the best there is in the Philippines. Schadow1 Expeditions highly recommends Camiguin if you want a laid-back, adventure filled vacation in the Philippines. The waypoints, road and tracks data gathered in this Camiguin Roadtrip has been mapped and contributed to the +OpenStreetMap Philippines project for free use of travelers who plan to roam around Camiguin with GPS assistance. Some articles/links in this article are not yet available as they are still being written. Please come back once in a while until we complete them. This article is a summary of our Camiguin getaway and would be helpful for those who wish to visit Camiguin and plan their itinerary. Ok lang yun. There will still be a next time. Kaamulan Festival is a bomb! I'm sure you guys enjoyed it! Updated the article regarding how to get to Camiguin. Starting April 15, 2013, Cebupac will be flying directly to Mambajao Airport from Mactan Airport Cebu. 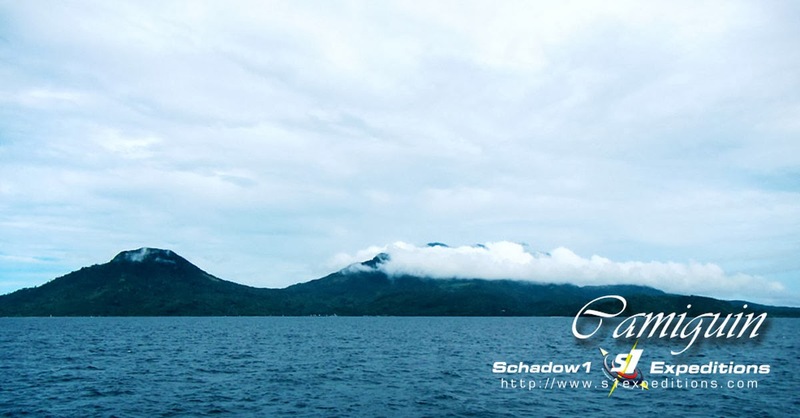 Schadow1 Expeditions' account of the Island of Camiguin has been completed (Part 1 to Part 11). All links are now available for reading. How much if motorcycle owned ang e dala pila plete sa barge?